SINGAPORE: Genting Singapore said yesterday it will open the first part of its US$4.4 billion (US$1 = RM3.39) casino-resort in the city-state on January 20, beginning with four hotels. "Resorts World Sentosa is working closely with the authorities to obtain approvalsfor Universal Studios Singapore, which will open next," the company said in a statement. Genting Singapore, a unit of Malaysia's Genting Bhd (3182), said it will announce the start date for the casino when it receives the licence from Singapore authorities. The city-state's other casino-resort, Las Vegas Sands' US$5.5 billion Marina Bay Sands, is scheduled to begin its phased opening in April, although many analysts doubt if the firm can meet the target date. 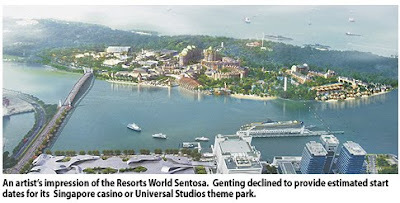 Genting declined to provide estimated start dates for its Singapore casino or Universal Studios theme park, region's first, although a spokesman said testing and commissioning of the various rides had started in early November. A spokeswoman for Singapore's Casino Regulatory Authority said Genting made an initial submission for a casino licence in October 2009 and the completed application package was received in December. Singapore casino laws are based on regulations in the US and Australia. 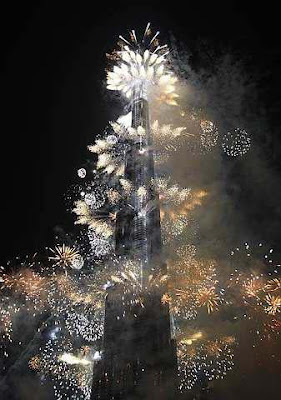 DUBAI, United Arab Emirates: Dubai opened the world's tallest skyscraper Monday in a blaze of fireworks, then added a final flourish: It renamed the tower for the head of neighboring Abu Dhabi, whose billions bailed out Dubai amid last year's financial crisis. Long known as Burj Dubai - Arabic for "Dubai Tower" - the building rises 2,717 feet (828 meters) from the desert. The $1.5 billion "vertical city" of luxury apartments and offices and a hotel designed by Giorgio Armani also plans to have the world's highest mosque (158th floor) and swimming pool (76th floor). Its backers wanted the skyscraper to be a monument to the boundless, can-do spirit of Dubai - one of a federation of seven small sheikdoms that make up the United Arab Emirates - but the timing could not be worse. Property prices in parts of Dubai collapsed by nearly half in the past year, the result of easy credit and overbuilding during a real estate bubble that has since burst. Thousands of cheering, clapping spectators watched as a tally projected on huge screens at the opening ceremony revealed the tower's most closely guarded secret - its height of 2,717 feet. That made it more than 1,000 feet (305 meters) higher than the skyscraper known as Taipei 101 in Taiwan, which at 1,667 feet (508 meters) had been the world's tallest since 2004. The tallest building in the United States, the Willis Tower in Chicago, comes in at 1,451 feet (442 meters). 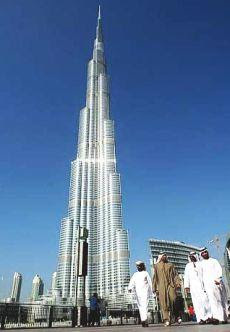 Another view of world's tallest building. Before they were destroyed in the Sept, 11, 2001, attacks, the World Trade Center towers both topped 1,360 feet (414.5 meters). The Freedom Tower being planned for the site will measure 1,776 feet (541 meters), with completion estimated in 2013. Mohammed Alabbar, chairman of the tower's developer Emaar Properties, initially said Monday it had "more than 200" stories, but he later backtracked to more than 165 inhabitable floors, given its tapered top. Promotional materials sent before the tower's opening said it contained 160 stories. Greg Sang, Emaar's director of projects, said the Burj Khalifa has "refuge floors" at 25 to 30 story intervals that are more fire resistant and have separate air supplies in case of emergency. Its reinforced concrete structure, he said, makes it stronger than steel-frame skyscrapers. "I have no doubt that it has been looked after very well in terms of design and construction," he said when asked about the building's safety. "I would be much more comfortable getting into a building like this knowing that so much background work has gone into it." The sheikdom shocked global markets last year when it unexpectedly announced plans to reorganize its main state-run conglomerate Dubai World and sought new terms in repaying some $26 billion in debt. It got some aid from Abu Dhabi's bailouts. Dubai's hereditary ruler, Sheik Mohammed bin Rashid Al Maktoum, in recent months has increasingly spoken of the close relationship between the two emirates, declaring in November that "Dubai and Abu Dhabi are one" and will "be there for each other." Sheik Mohammed serves as vice president and prime minister of the UAE federation. Analysts had questioned what Dubai might need to offer in exchange for the financial support it received from Abu Dhabi, which controls nearly all of the UAE's oil wealth. Abu Dhabi provided $25 billion last year as Dubai's debt problems deepened. "We weren't sure how high we could go," said Baker, of Skidmore, Owings & Merrill. Work began in 2004 and moved rapidly. At times, new floors were being added almost every three days. During the busiest construction periods, some 12,000 people worked at the tower each day, according to Emaar. Low-wage migrant workers from the Indian subcontinent provided much of the muscle. It is visible across dozens of miles of rolling sand dunes outside Dubai. From the air, the spire appears as an almost solitary, slender needle. An observation deck on the 124th floor opens to the public Tuesday, with adult tickets starting at 100 dirhams, or just over $27 apiece. The ride to the top took just over a minute during a visit for journalists Monday. DUBAI: Started at the height of the economic boom and built by some 12,000 labourers, the world’s tallest building opened yesterday in Dubai as the glitzy emirate seeks to rekindle optimism after its financial crisis. Burj Dubai, whose opening has been delayed twice since construction began in 2004, marked another milestone for the deeply indebted emirate with a penchant for seeking new records. With investor confidence in Dubai badly bruised by the emirate’s announcement in November that it would seek a debt standstill for one of its largest conglomerates, the Burj Dubai is seen as a positive start to the year after a bleak 2009. But despite the criticism, many say the edifice, believed to have cost US$1.5bil to build, is an architectural marvel. The tower’s height has been kept a closely guarded secret until now. Developer Emaa Properties PJSC will reveal the height – known to exceed 800 metres (2,625 feet) – today and Dubai’s ruler will inaugurate the opening. Experts believe Dubai’s recent financial troubles have not hurt sales of about 1,100 residential units in the Burj – meaning tower in Arabic – saying they were nearly all sold. Dubai’s real estate sector crashed at the end of 2008 when the global financial crisis hit the emirate after a six-year economic boom. Thousands of jobs were slashed and projects worth billions of dollars were cancelled or delayed. With analysts suggesting tax-free Dubai might sell some of its assets to boost revenues and slash US$80bil in debt, many wondered if the tower was on the list for grabs. KUALA LUMPUR: Tower Real Estate Investment Trust will post a RM5.8 million surplus from the revaluation of its three prime land commercial properties here. These include the 32-storey Menara HLA in Jalan Kia Peng and HP Towers, which comprise two blocks of nine and 21 storeys each, in Jalan Gelenggang within the Bukit Damansara enclave. Tower had also revalued its 20-storey Menara ING, which is situated in Jalan Raja Chulan, the company said in statement to the exchange today. "The purpose of the revaluation was to ascertain the current market values of Menara HLA, HP Towers and Menara ING for accounting purposes in line with the Financial Reporting Standard (FRS) 140. "Under the fair value model of FRS 140, the fair value of the investment property shall reflect market conditions at the balance sheet date," Tower said. Following the revaluation which was undertaken last month (December 2009), Menara HLA now has a market value of RM295 million, a surplus of RM4.9 million on top of the commercial entity's RM290.13 million net book value as at Nov 30 2009. Menara ING registered an almost RM9 million surplus, resulting in a market value of RM94 million compared with its NBV of RM93.1 million. HP Towers which is worth RM207 million, however, saw no change to its market value. Based on Tower's latest unaudited quarterly financial statement as at Sept 30, 2009, its net asset value per unit of RM1.5994 will increase to RM1.6196 upon incorporation of the revaluation surplus of RM5.8 million. The valuation exercise was conducted by Rahim & Co Chartered Surveyors Sdn Bhd.